طاهرخانی, حسن, عبدالهی درآباد, حسین. (1397). بررسی عملکرد روسازی مرکب تحت بارگذاری جانبی و افقی به روش المان محدود. پژوهشنامه حمل و نقل, 15(2), 173-195. حسن طاهرخانی; حسین عبدالهی درآباد. "بررسی عملکرد روسازی مرکب تحت بارگذاری جانبی و افقی به روش المان محدود". پژوهشنامه حمل و نقل, 15, 2, 1397, 173-195. طاهرخانی, حسن, عبدالهی درآباد, حسین. (1397). 'بررسی عملکرد روسازی مرکب تحت بارگذاری جانبی و افقی به روش المان محدود', پژوهشنامه حمل و نقل, 15(2), pp. 173-195. طاهرخانی, حسن, عبدالهی درآباد, حسین. بررسی عملکرد روسازی مرکب تحت بارگذاری جانبی و افقی به روش المان محدود. پژوهشنامه حمل و نقل, 1397; 15(2): 173-195. در این تحقیق، اثر اعمال بار افقی، قائم و جانبی وارده از وسایل نقلیه بر روی تنش برشی بین لایه رویه و اساس، جابه‌جایی جانبی و طولی رویه و حداکثر کرنش کششی در رویه مورد مطالعه قرارگرفته است. اثرات سه حالت مختلف بارگذاری، شامل اعمال بار قائم، بار قائم و افقی به‌طور همزمان و بار قائم، افقی و جانبی به ‌طور همزمان مورد بررسی قرارگرفته است. بار از طریق دو آرایش چرخ شامل زوج چرخ و تکی عریض با وزن محور ثابت 2/8 تن و فشار باد kPa600 به سطح روسازی اعمال‌شده و پاسخ‌های روسازی در دو دمای 20 و °C40 تعیین گردیده‌اند. تحلیل با استفاده از مدل‌سازی سه‌بعدی با روش المان‌های محدود در نرم‌افزار ABAQUSانجام‌گرفته است. نتایج نشان‌ دهنده این است که بارگذاری افقی تأثیر قابل‌توجهی بر کرنش کششی در سطح، تنش برشی بین دولایه و جابه‌جایی جانبی و طولی دارد.در دمای °C20، با اعمال بار افقی به میزان 50% بار قائم، برای حالت زوج چرخ، تنش برشی، حداکثر کرنش کششی در سطح، جابه‌جایی طولی و جابه‌جایی جانبی، به ترتیب، 76، 286، 329 و 5/15% نسبت به حالت تنها اعمال بار قائم افزایش یافتند. همچنین، نتایج بیانگر این است که چرخ‌های عریض پاسخ‌های بزرگ‌تری را در روسازی نسبت به زوج چرخ ایجاد می‌کنند. به طوری که جابه‌جایی طولی و جانبی در دمای 40 درجه در چرخ عریض به ترتیب 7/1 و 8/1 برابر زوج چرخ به‌دست‌آمده‌اند. همچنین، نشان داده شد که در نظر گرفتن بار جانبی تغییر قابل‌توجهی در کرنش کششی سطح و تنش برشی و حداکثر جابه‌جایی طولی ایجادشده تحت بار قائم و افقی ایجاد نمی‌کند. افزایش دما باعث افزایش قابل‌توجه در کرنش سطحی و جابجایی‌های طولی و جانبی داشته اما تأثیر قابل‌توجهی در تنش برشی بین لایه رویه و اساس ندارد. In this research, the effects of vertical, horizontal and lateral loads of traffic on the shear stress at the interact of surface and base layer, longitudinal and lateral displacement and the maximum tensile strain at the top of surface layer have been investigated. Three different loading conditions, including only vertical, vertical and horizontal, and vertical, horizontal and lateral, simultaneously, have been investigated. The horizontal and lateral loads were considered to be 50% and 20% of the vertical load, respectively. The loads were applied on two different tire configurations, including dual tires and wide-base tire, with a constant axle load of 82kN and tire pressure of 600kPa, at two temperatures of 20 and 40°C. The analysis was conducted using 3D finite element modeling in ABAQUS. The results show that the horizontal loading has a significant effect on the tensile strain at the surface, shear stress at the interface and the horizontal and lateral displacements, such that, for example, at 20°C, the maximum horizontal strain on the surface, shear stress at the interface, horizontal and lateral displacements under dual tires with vertical and horizontal load, are 76, 286, 329 and 15.5% higher than those under only vertical load. Results also show that the wide-base tire has more detrimental effect than the dual-tire, such that, the maximum horizontal strain at the surface, shear stress at the interface, horizontal and lateral displacements under the wide-base tire with vertical, horizontal and lateral load at 40°C are, respectively, 1.53, 2.43, 1.7 and 1.8 times higher than those under dual tire. The results also reveal that applying lateral load does not significantly affect the responses, except the lateral displacement. Also, while the shear stress at the interface is not significantly affected by temperature, the horizontal strain at the surface and the displacements increases significantly with increasing temperature. - طاهرخانی، ح. و مرادلو، الف. 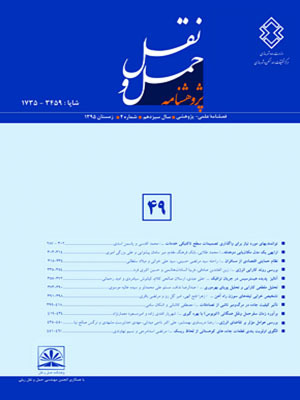 و جلالی جیرندهی، م.، (1395)، "بررسی اثر فشار باد چرخ بر پاسخ‌های روسازی‌های مسلح شده با ژئوسنتتیک با تحلیل ویسکوالاستیک به روش المان‌های محدود با استفاده از نرم‌افزار­ABAQUS"، مجله مهندسی حمل‌ونقل، دوره 8، شماره 2، ص. 342-323. - Gideon, C.S., Kishnan, J. (2012), "Influence of horizontal traction on top-down cracking in asphalt pavements", in: 7th RILEM Int. Conf. on Cracking in Pavement, Springer, Netherlands, pp. 1069-1079. - Hazaree, C., Ceylan, H., Wang, K. (2011), "Influences of mixture composition on properties and freeze–thaw resistance of RCC", Construction and Building Materials, Vol. 25, pp. 313-319. - Hua, J. (2001), "Finite Element Modeling and Analysis of Accelerated Pavement Testing Devices and Rutting Phenomenon", Ph.D. Thesis, Purdue University, USA. - Huang, Y.H. (2004), "Pavement analysis and design", 2nd Ed Upper Saddle River, NJ Prentice Hall. - Kim, D. (2008), "Super-single tire loadings and their impacts on pavement design ", Canadian Journal of Civil Engineering, 35, (2), pp, 119-128. -Krishna Rao, S., Sravan, P., Chandrasekhar Rao, T. (2016), "Abrasion resistance and mechanical properties of Roller Compacted Concrete with GGBS", Construction and Building Materials, Vol. 114, pp. 925-933. -Li, S., Liu, X., Liu, Z. (2014), "Interlaminar shear fatigue and damage characteristics of asphalt layer for asphalt overlay on rigid pavement", Construction and Building Materials, Vol. 68, pp. 341-347. -Liao, Y. (2007), "Viscoelastic FE Modeling of Aaphalt Pavements and its Application to U.S. 30 Perpetual Pavement", Ph.D. Thesis, Faculty of the Russ College of Engineering and Technology of Ohio University. -Liu, Li,. Hao, P. (2011), "ABAQUS Program-based Numerical Analysis on U-shaped Cracking of Asphalt Pavement", Nation West traffic science and technology construction Project, IEEE, pp. 2861-2864. -NCHRP (National Cooperative Highway Research Program), (2012), " Optimization of Tack Coat for HMA Placement", NCHRP Report 712, Washington, USA. - Nunez, O. (2007), "Composite Pavements: A Technical and Economic Analysis during the Pavement Type Selection Process", Master thesis, Virginia Polytechnic Institute and State University, USA. -Nunn, M. (2004), "Development of a more versatile approach to flexible and flexible composite pavement design", TRL Report TRL615, Highways Agency, Berkshire, U.K.
-Omran, A., Harbec, D., Tagnit-Hamou, D., Gagne, R. (2017), "Production of roller-compacted concrete using glass powder: Field study", Construction and Building Materials, Vol, 133, pp 450-458. "Visco-Elasto-Plastic Constitutive Law for a Bituminous Mixture under Repeated Loading", Transportation Research Record 911, National Research Council, Washington, D.C, pp 20-27. - Rith, M., Kim, Y. K., Hong, S. J., Lee, S. W. (2016), "Effect of horizontal loading on RCC-base composite pavement performance at heavy duty area", Construction and Building Materials, Vol. 131, pp.­741-745. -Romanoschi, S.A., Metcalf J.B, (2001),"Effects of Interface Condition and Horizontal Wheel Loads on the life of flexible pavement structure", Design. Rehabil. Pave., TRB, TRR No. 1778, pp. 123–131. - Salama, H., Chatti, K. (2006), "Evaluating Flexible Pavement Rut Damage Caused by Multiple Axle and Truck Configurations", Proceedings of the 9th International Symposium on Heavy Vehicle Weights and Dimensions, Pennsylvania. -SHRP (Strategic Highway Research Program), (2013), "Composite Pavement System–HMA/PCC Composite Pavement, Vol. 1", Transportation Research Board (TRB), Washington, DC. -Simulia, (2016), "Abaqus Ver 6.14 Analysis User’s Manual"
-Smith, R. J. (1963), "Definition of composite pavement structures", Highway Research Record, 37, pp. 1-4. -Sun, Lu., Duan, Y. (2013), "Dynamic response of top-down cracked asphalt concrete pavement under a half-sinusoidal impact load", Springer-Verlag Wien, pp. 1865–1877. -Uzarowski, L. (2006), "The Development of Asphalt Mix Creep Parameters and Finite Element Modeling of Asphalt Rutting", Ph.D. Thesis, University of Waterloo. Canada. -Von Quintus H.L. (1994), "Performance Prediction Models In the Superpave Mix Design System", Strategic Highway Research Program, SHRP-A-699, Washington, D.C.
-Zhao, Y.; Alae, M.; Fu, G. (2017), "Investigation of mechanisms of top-down fatiguecracking of asphalt pavement", Road Materials and Pavement Design, pp. 1-12.